Originally posted on Ghost Cult Magazine’s website 12/09/2013. 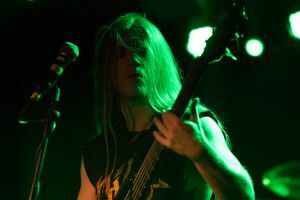 Dallas Toler-Wade has been the established frontman for a couple of albums now and while the stability as brought us Annihilation Of The Wicked new opus ‘The Gates Of Sethu’ falls just short of the Egyptologists high standards. Karl Sanders steady hand has seen the band through the departure of Chief Spires and Jon Vesano yet before their hymns to Ra may begin, we have Frenchmen Svårt Crown and Canadians come Roman centurions Ex Deo to lead the charge. Svårt Crown’s atmospheric death metal rumblings rely more upon mid-paced grooves rather than harsh blast fury. The flex their Gallic muscle admirably yet the crown seem keen to save their energy for the headliners. Battle flags litter the stage as a fanfare of horns sound from the P.A. announcing Ex Deo to the stage. Bedecked in battle armour they certainly look the part but the first few numbers they play lack the kind of call and response chorus these legionnaires should be delivering. ’Teutoburg (Ambush of Varus)’ is far better, straight in for the kill with a vicious breakdown and mighty chorus, perhaps this was not there night but Rome was not built in a day after all. Nile takes to the stage needing no such trappings. The cobra backdrop is the only prop Sanders and company require, preferring to let their vicious groundbreaking death metal speak for itself. Yet while numbers from the current album are powerful, the Carolina crew have never matched the glory days of In Their Darkened Shrines. 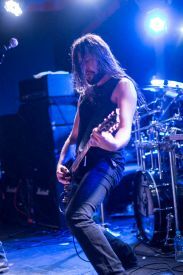 The setlist is heavy on the new album and as such, the songs are given a polite response compared to the fevered reaction, which greets established classics.The Blessed Dead’ is the yardstick by which symphonic death metal should be measured and ‘Sarcophagus’ see’s a furious pit ignite with George Kollias titanic percussion so thunderous it could wake the pharaohs. ‘Lashed To The Slave Stick’ is ferocious with Toler-Wade and Sanders trading chilling guttural roars and expected finale ‘Black Seeds Of Vengeance’ is giving an expectedly rapturous reception. 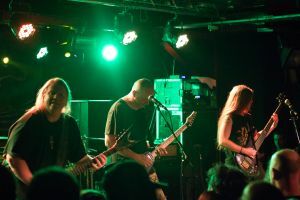 Not the most impressive showing from Nile but still once, which should have many death metal bands quaking in their boots. Praise be to the Gods of the underworld for they have sent forth an act who remain at the helm of Death Metal’s upper echelon. This entry was posted on November 4, 2013 by bakerross. It was filed under LIVE REVIEWS and was tagged with Ghost Cult Magazine.